So you've locked down the band or DJ of your dreams for the party. 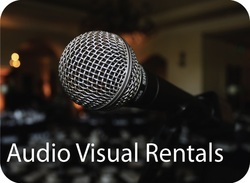 Please consider us for your audio visual provider for any rentals you may need - at the rehearsal dinner the night before, corporate meetings before the party, and more. We have wireless mics and sound systems of all sizes for any application. We also have projectors, screens, DVD players, laptops and LCD/plasma screens for any visual presentations you may have. Lighting goes hand in hand with great sound. 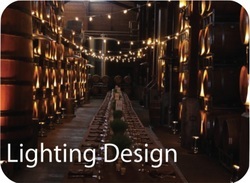 We offer full production lighting - let our team design a lighting package to suit your budget. And we can spice up your event further with a few fun extras. 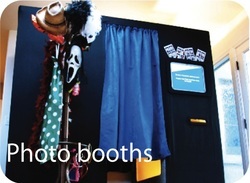 Add a photo booth for your lounge area so your guests can make a photo guest book, or just get silly! 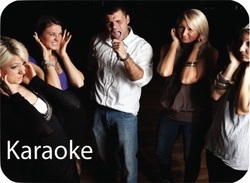 We are also proud to offer high quality Karaoke systems - a great icebreaker at family reunions, corporate parties, and even wedding rehearsal after parties!